Outdoor carpet is a great way of completely changing the look and feel of an outdoor area. Outdoor area rugs are perfect for patios, pool areas and children’s play areas or any outdoor area where the soft feel of carpet is needed under your feet. Outdoor rugs are a simple and affordable way of covering hard concrete areas and the look of an outdoor rug can completely transform a drab and colorless area. When shopping for carpet for an outside living area, ensure that the carpet or rug is specifically made for the outdoors. In other words, it should resist the sun’s rays to prevent fading and resist moisture to reduce the build up of mold. Polypropylene is one of the materials used in outdoor carpets and rugs because of its durability. Outdoor carpet should also be easily washed either by being hosed down or if you have an outdoor area rug then it should be hand or machine-washable. Braided rugs are particularly attractive in an outdoor area and look particularly good under a patio table. Ensure that if you purchase a braided rug that it is specifically made for the outdoors as it will deteriorate very quickly. Outdoor rugs are cost effective and have the added advantage of being easily relocated if required. Outdoor living spaces like patios and decks deserve the same attention to detail and decoration as your living room or kitchen. There’s more to decorating your patio than just choosing patio furniture that you like. The decor that you choose will set the tone, whether it’s casual, country chic, Mediterranean or modern. Some care and attention can turn your outdoor deck into an inviting, comfortable place to relax and entertain. All the same principles that apply to interior decorating apply equally to designing your outdoor spaces. One of the basic principles of interior design is to define the areas of an open room with carpets and area rugs. This is a principle that’s only recently coming into use outdoors as new materials like polypropylene are developed and refined. Long gone are the days when an outdoor carpet meant one of those grassy-green plastic mats that never looked like real grass no matter how well made it was! The availability of such materials as olefin, polypropylene and other acrylics has moved the concept of decorating with area rugs outdoors. Your choices for outdoor rugs today are as varied and attractive as carpets you might choose for your living room or family room. Choose a pattern that accents your patio furniture or contrasts with it. Define a conversation area of benches with a subtly patterned Oriental look-alike. For a more unusual look, try the reverse. Outline a seating area with patterned runners in an outdoor weave and leave the floor within bare. * An outdoor rug with a woven pattern of crayons, ABC’s or numbers. Caring for an outdoor rug can be as simple as hosing it down with a garden hose. Outdoor rugs are an inexpensive way to add warmth and drama to your patio or deck. Take full advantage of the wide variety of patterns and styles to make your outdoor living area as beautiful as your indoor rooms! 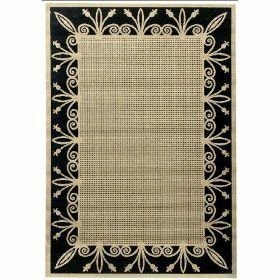 Area rugs for those outdoor areas really add a touch of style and class to any home. Outdoor rugs are available in durable fabrics that will withstand the elements and constant wear and tear associated with heavy traffic and the changing seasons. Although rugs for the outdoors can be made from a variety of materials, the most commonly used is polypropylene because of its strength and resistance to the elements. The best quality outdoor carpet resists mold, moisture and most stains and are UV protected to prevent fading from the suns rays. Outdoor braided rugs are particularly attractive because of their vibrant colors and patterns. They are generally soft on the feet so they are suitable for both indoors and outdoors especially in kitchen areas where the cook is often standing for long periods of time. Because of their sustained durability, outdoor rugs are a great idea to use in rumpus rooms, children’s play areas, or other high traffic areas of your home. 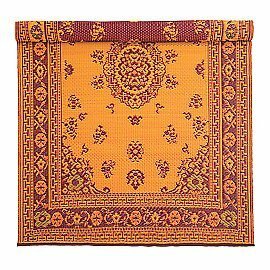 Outdoor rugs for the patio or porch area are available in a great range of styles and colors, so dress up the porch or patio area of your home with durable, colorful area rugs. They look splendid when spread out under the barbecue table. Where Can You Buy Outdoor Rugs Online? For an extensive range check out Amazoncom . What are Your Choices for Patio Rugs? 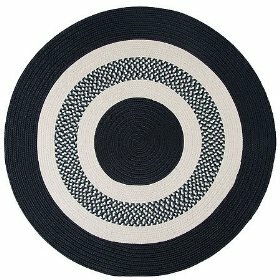 Comments Off on What are Your Choices for Patio Rugs? Why treat your patio any differently than any other room in your home? Beautiful furnishings, themed decor and traditional decorating accents can make your outdoor space a welcoming room that your family and guests will enjoy spending time in. In fact, a patio and backyard can often be more than one room, with different areas clearly defined by the furnishings, décor and patio rugs. The traditional decorating tips for making the most of large spaces apply as well to the outdoors and your patio as they do to any large room in your home. One of the most common decorating tricks to help set off an area of a room is to use an area rug to define the space. While the idea of using an area rug outdoors may seem strange at first, there are many designs and styles of patio rugs that are durable and weather-resistant. What sort of fabric should you look for when choosing an outdoor patio rug to brighten up your outdoor living space? Avoid wool rugs for outdoor patio areas. The natural moisture outdoors can collect in the fibers, encouraging mold and rot, and contributing to a musty smell. In addition, the UV rays from the sun will break the material down and fade colors quickly. Sisal, jute and sea-grass may seem like good natural alternatives. After all, the plants grow outside! Unfortunately, the woven fibers don’t withstand weather very well. Even if your patio is completely enclosed, the likelihood of high traffic makes natural materials like sisal and jute a poor choice for a patio rug. If you want to use natural materials, cotton is one of your best choices. If the rug is small enough, you can toss it into the washer, or have it professionally cleaned, and if the day is sunny and the rug is light enough, you can dry it outdoors on the patio. 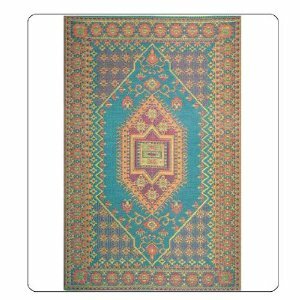 The best choices for cotton patio rugs are those that have no pile, or that are tightly woven and flat, like a dhurrie rug with a colorfast design. The sun and weather will fade the colors rather quickly, though, so these are best on a covered patio or porch. By far, the best material for an outdoor are rug is the synthetic polypropylene. First developed in the late 1940s and used for furniture upholstery, polypropylene has grown up to be one of the most versatile carpeting materials available. It dyes well, allowing bright and subtle patterns for accent, and modern manufacturing techniques have created versions of polypropylene that mimic many natural materials, including jute and sisal. Patio rugs made of polypropylene are resistant to fading from the UV rays of the sun, which make acrylic rugs a poor choice for outdoors. It dries quickly, as the individual fibers are not absorbent. The same quality makes it easy to clean a polypropylene patio rug. You can simply hose it down with a garden hose and allow it to dry. Sturdy and attractive, polypropylene patio rugs are your best choice for a high traffic outdoor area. Putting a decorative door mat at your front or back door may serve a practical purpose, but that’s no reason to settle for a common, dull door mat. 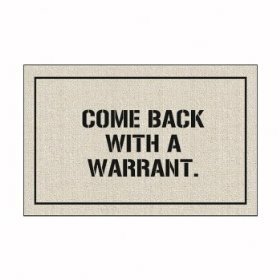 We’ve all seen them – door mats made of reclaimed tire rubber or heavy duty brush that are meant to trap the dirt on your shoes before you step into someone’s home. How plain and blah is that? Instead, why not choose a decorative outdoor mat that is more than purely functional. Indeed, why not choose two – a heavy duty indoor-outdoor mat on the front stoop, and a prettier one inside the door that fits into the decor of your foyer or entryway? Skip the plain rubber and steel tire tread doormats. Your outdoor mat should certainly be made of a sturdy material that can stand up to the weather – and being walked on, but there’s no reason for it to be ugly. Choose a decorative door mat that wears like iron – because it is. 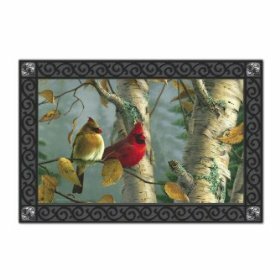 A number of companies sell decorative door mats made of cast iron or aluminum with cast and scrolled designs that add classic appeal to your front door stoop. Among the most popular motifs are pinecones and pineapples – traditional Colonial symbols of Welcome. 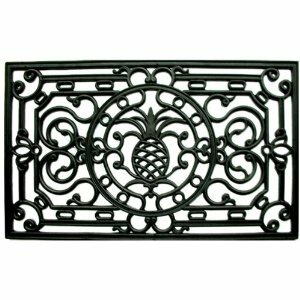 If metal seems a bit harsh underfoot, there’s always the option of rubber – cast and cut in fanciful and beautiful scrollwork designs that mimic the classic cast iron designs. Slatted wood makes beautifully simple outdoor decorative door mats that are easily washable and weather as only natural materials can. Yet another sturdy and often-used material for outdoor door mats is coir fibre – that stiff, brush like stuff you might recall from childhood mats. Today’s designs in coir fibre are dyed or sculpted to be decorative as well as functional, and clean with just a hosing. Olefin, also known as polypropylene, has made it possible to have decorative door mats that are as varied as the carpets inside your home. You can choose from an almost limitless variety of themes and designs – fruit slices, sailboats, doggy and kitty designs – many of them available with your name customized on them. Like coir fiber, decorative door mats made of olefin hose clean – and dry quickly. Indoor mats needn’t stand up to the weather, but should be durable and washable. There are many fine choices of olefin decorative doormats that range in design from the ubiquitous poker-playing dogs to those that mimic a fine Aubusson carpet.